Can you believe Thanksgiving is next week? This year is quickly coming to a close, and Black Friday will be here before you know it! Though all four of our locations will be closed to celebrate the Thanksgiving holiday with our family and friends, we have a very special Black Friday deal for all of you! 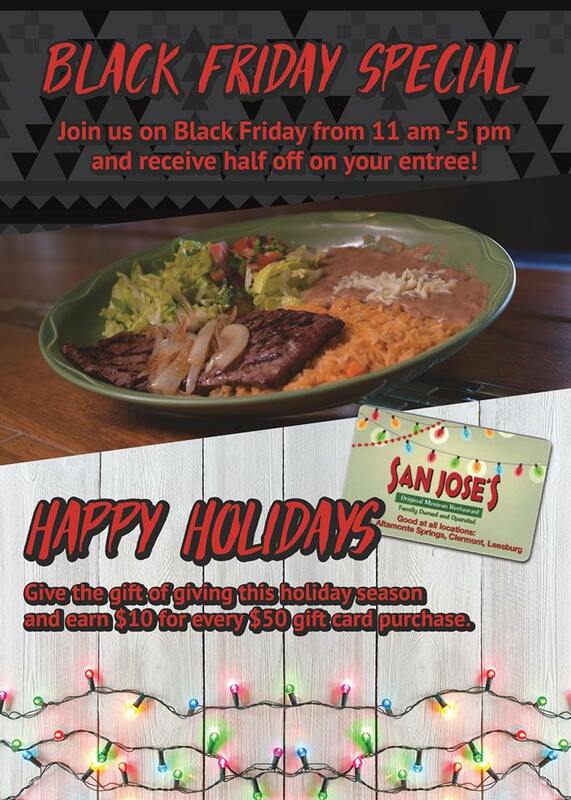 That's right, head into your local San Jose's Original between 11 AM - 5 PM on Black Friday and you will receive any entree for HALF PRICE! Everything from our California Burrito to our Enchilada San Diego to our Fish Tacos will be 50% off during the aforementioned hours! Grab your friends, shop ‘til you drop, and then join us for lunch! We also have gift cards available for anyone looking to give the gift of a full belly this year! What's even better is that for every $50 gift card you buy, you will receive $10 for free! Grab your teachers’ presents or those Secret Santa gifts you need from your favorite local Mexican Restaurant, because we all know everyone loves tacos! We wish you and your family nothing but happiness and joy this holiday season. Happy Holidays from our Family to Yours!